We've all seen the devastating effect a storm or similar natural malady can have on an urban environment. Most of the time, trees are able to hold their own against the most menacing of winds, but even the tallest-standing tree can fall in the right circumstances. People can get out of the way of a falling tree, but property rarely enjoys such flexibility – cars, roofs, rain gutters, windows, benches, garages... These are just some of the frequent victims of trees falling over. If a tree decided to work against your day-to-day in a similar capacity, you might be thinking: "How long will I have to wait to return to normal?" We're happy to answer that with a "not very long". In most cases, we're able to dispatch someone to your location in a minimal amount of time from the moment we receive your urgent call. Don't worry about the specific issue you're dealing with – all emergency calls are equally as valid to us and we're just as ready to handle smaller problems as we are overwhelming difficulties. 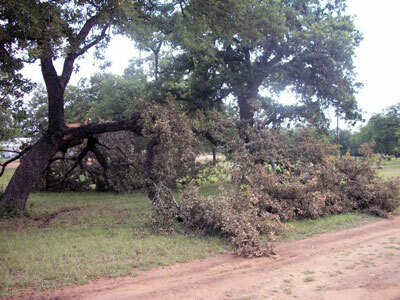 Upon arrival, our arborists will assess the scale of damage and work with you to reconstruct what happened. Doing so will give us a better idea of how to proceed and will let us handle your issue with greater ease. An important point we need to make is that we won't take advantage of you in a vulnerable time by trying to charge you additional fees because we feel you aren't able to say no – this isn't how we do our work. Our emergency tree service isn't just convenient – it's also reasonably affordable, meaning there's no reason to wait if an issue is truly bothering you and making your life difficult. 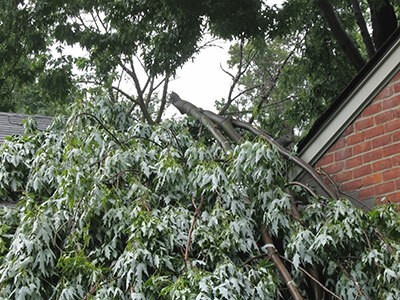 As already mentioned, there are many valid reasons why you might call us for emergency tree service – from falling trees to broken branches and other less-common issues. You don't even need to know the best course of action in whatever situation you're dealing with – picking up the phone is the extent of what you need to do to have your urgent tree-related issue dealt with quickly. In line with our obligation to go above and beyond the services we offer, our arborists can also help you recover from the losses you've experienced. Hauling away a tree is easy (when working with professionals) – the question of "What next?" is often left hanging in the air. Not with us – we'll help you assess the damage and figure out how you can get back what you lost. We can connect you with different contractors in the area that can help repair your home or property after we have done our job, and we'll also instruct you on other safety hazards that should be taken care of. Day or night, workday or holiday – call us regarding a tree issue that can't wait and we assure you that it won't.